More American children suffer long-term life-harm as a consequence of reading difficulties than from parental abuse, accidents, and all other childhood diseases and disorders combined. In purely economic terms, reading related difficulties cost more than the war on terrorism, crime, and drugs combined. We need to reframe our society's thinking about what's at stake and what's involved in learning to read. Note: Click on any word on this page to experience the next evolutionary step in technology supported reading. In the U.S. alone approximately one hundred million children and adults have difficulty reading. The cognitive, linguistic, academic, emotional, social, and physical health consequences of their reading difficulties significantly diminish their opportunities in school, work, and life. In the aggregate, reading difficulties skew our democracy, drag our economy, perpetuate poverty, and cost U.S. taxpayers hundreds of billions of dollars each year. Reading improficiency is our nation's most wide-spread and costly learning disability and nothing short of a complete REFRAME in how our society thinks about 'what's at stake' and 'what's involved' is going to improve the situation. The first step in 'reframing' how our society thinks about reading is to update our understanding of what reading is. d) the child's EMOTIONAL RESPONSE to all the above. "No one is to blame, we are all responsible"
Many other factors contribute to and exacerbate these root issues: Innate learning differences and disabilities, parental education and involvement, preschools and print exposure all contribute to a child's readiness or lack thereof. Limited English proficiency, the proliferation of media (TV, Video Games...), incompetent instruction, inadequate teacher training, the 3rd-to-4th grade switch to 'reading to learn", our education system's resistance to change, and our society's shallow thinking about reading all exacerbate the confusion. Making all of the above more difficult, educators, parents, and society as a whole, conspire (unintentionally but insidiously-pervasively) to cause children to feel like they are at fault for the difficulties they experience. "...Children of professional parents -- I mean, talkative families and college educated -- heard forty-eight million words addressed to them by the time they're four. Children in welfare families who were taciturn heard thirteen million words addressed to them by the time they were four." - Dr. Todd Risley, co-author "Meaningful Differences in the Everyday Experiences of Young American Children"
Building on 'CHILD'S FAULT' from 'Causes and Contributing Factors', this module's first segment provides the starting point for appreciating the “SHAME” that struggling readers experience. Next, “The Power of Shame” discusses shame's painful life-long and often life-distorting effects. The next three segments explore the “Public Shame” of the classroom; the “Fear of Shame” felt by children as they anticipate being asked to read out loud in classrooms, and how both drive the “Secret Shame” that causes children to hide their reading difficulties from parents, teachers, and peers. “Emotionally Learning Disabling” and “Avoidance” build on the previous segments and show how powerfully behavior-determining and learning-disabling shame avoidance can be. Finally, “Cognitively Learning Disabling” begins our discussion of the ‘downward spiral of shame’ (another future module) and describes how shame disrupts, distracts, and chokes the cognitive processing that is necessary for learning to read in the first place. Dr. Maryanne Wolf: You know I haven’t thought in these terms. But as you say them there is no question that’s our enemy. Shame. Dr. Donald Nathanson: “Like most scholars, until awakened by the “Children of the Code” project, I took reading as much for granted as eating and drinking. Very few of us have paid sufficient attention to the specific emotions triggered in children as they begin to read. Yet any impediment to mastery of the confusing code that connects spoken and written English must trigger shame, the emotion that stops all useful thought. So painful does shame become in the public arena of the schoolroom that our children swiftly divide into two streams and two futures purely on the basis of their response to the shame that accompanies the struggle to learn our written language. Understanding the code and its history is essential to understanding the "CONFUSION' involved in learning to read it today. The "Power of Writing" begins our journey into the profound cognitive and institutional consequences of becoming code users (writers and readers). Next, "The Alphabet's Big Bang" and "Grecian Formulas" explore the origin of the Alphabet and it's unparalleled effects on the minds and institutions that gave rise to western civilization (future segments will address oral cultures and pre-alphabetic writing systems). In "Lend Me Your Ears" we introduce the initial relationships between letters and sounds (critical background for future segments on how the code became so complex). And, in the "Code of da Vinci" we present the code as both the 'DNA of science' and the 'media that enabled the Renaissance'. Finally, we review the "Spread, Rise, and Fall of Literacy" which sets the stage for "A Brief History of the Code - Part 2: Ye First Millennium Bug". "Once we start writing, we are able to then reflect back upon what we have written, and we enter into this kind of recursive relation to our own written signs. And, so, only then, a certain degree or experience of self-reflection that we now sort of take for granted, comes into being." – David Abram, Philosopher and Ecologist, Author: The Spell of the Sensuous. Though readiness and readiness differentiated instruction reduce the difficulty, working through the code's confusing letter-sound relationships is what most challenges the brains of most struggling readers. There is a direct and causal relationship between the confusion in the code and the 'stutters' heard in the voice of a struggling reader. Obviously, understanding this confusion is critical to understanding the challenges involved in learning to read. As importantly, understanding how the code became so confused is critical to reframing the experience of struggling readers. The more we understand the accidents and negligence that led to the confusion in the English code the more it becomes obvious that it is absurdly negligent to blame and shame children for their struggle with it. With the printing of the King James Bible literacy began to spread. As it did, reading teachers began to realize that the letter-sound relationships in the code made learning to read English difficult. Phonics was born in the 16th century as an attempt to train the reader to process the unruly code. Over a century later the whole word method (originally developed for the hearing-impaired) began being used as an alternate to the 'tedious' 'rote' work of phonics. Paralleling the battle between these two teaching around the code polarities, another movement began which focused on reforming the code itself. The story of our attempts to change the code is fascinating and understanding these attempts, and why they failed, sheds important light on the social, political, institutional, and even scientific inertia that limits our understanding of the challenges involved in learning to read. "...as every letter ought to be, confin'd to one; the same is to be oberv'd in all the Letters, Vowels and Consonants, that wherever they are met with, or in whatever Company, their Sound is always the same." - Benjamin Franklin"
The second great obstacle is our absurd spelling, which scholars agree is the worst on the planet. In trying to learn this, two or three years are worse than waster" - Melvile Dewey (Dewey decimal system - champion of simplified spelling). Learning to read can be difficult for any one of a number of reasons. CRITICAL ELEMENTS: To construct the reading experience the brain must DIFFERENTIATE and process a number of elements including: Letters, Phonemes, Morphemes, and Vocabulary. CRITICAL PROCESSING: The brain must Automatize and Synchronize the sub processing of the critical elements. CRITICAL SPEED: The brain must process all the above fast enough to construct Recognizable Words at Speeds that approximate the rate at which the brain is accustomed to Recognizing Spoken Language. Processing speed is critical. Analysis of the Eye Movements of good readers reveals that, on average, the brain must process letters into sounds in less than a tenth of a second. THE BOTTLENECK: The 'stutters' in the voice of struggling readers reflect the time it takes the brain to work through the confusion in the code - the time it is taking to DISAMBIGUATE the code. Code disambiguation is the brain's greatest challenge during the process of learning to read. Exacerbating all the other challenges is the DOWNWARD SPIRAL that disrupts and dissipates the brain's processing when shame sets in. The Problem is essentially social-educational. For every child and adult who struggles and for all of us as a society, ’reading problems are always a consequence of ‘learning problems’. Improving the learning trajectories of children (and adults) who struggle with reading requires an Orientation Shift in how Parents and Teachers think about learning and the challenges involved in learning to read. Reading is an unnaturally confusing challenge to our brains. It takes a lot of (early life learning) brain exercise for a brain to be ready for the challenges involved in learning to read. Depending on how well Instruction meets brain Readiness, children follow one of Two Paths: the upward spiraling of Matthew Effects or the downward spiral of Confusion and Shame. We need to Boost Brain Readiness, Reduce Extraneous Ambiguity, and Reframe the emotional experience to minimize learner's propensity to blame themselves and trigger shame. We need to engage learners in ever more frequent, complex and rapid turn-taking Dialogue. We need to learn to Isolate, Vivify and give Feedback on the real-time edge of learning. We need to be very careful to Minimize our contributions to the shame struggling learners feel. Dr. David Abram: Like A Talking Stone David Abram, author of “The Spell of the Sensuous” discusses the parallels and differences between how non-literate indigenous people ‘read’ nature and how literate people read the alphabet. Dr. Alex Granzin: Not Terribly Natural? In this segment of our interview with Dr. Alex Granzin we discuss the unique form of confusion involved in learning to read and to what degree reading is natural. We also talk about ‘individualizing instruction’ and the difference between aggregate pattern based differentiated instruction and meeting actual individual learner needs. Dr. Alex Granzin: Maladaptive Feedback In this segment of our interview with Dr. Alex Granzin we discuss the downward spiral of shame and the maladaptive feedback cycle that undermines and disables learning. Dr. Alex Granzin: The Insidious Curriculum In this segment of our interview with Dr. Alex Granzin we discuss the insidious curriculum – how our education system is creating the conditions that result in children becoming learning disabled. Dr. Alex Granzin: Unhealthy Coping Strategies In this segment of our interview with Dr. Alex Granzin we discuss how the coping strategies adopted by struggling learners are in and of themselves learning disabling. Dr. Michael Merzenich: Part 1 segment includes: Personal Background, Neurological Correction, and Signal-to-Noise. Dr. Michael Merzenich: Part 2 segment includes: Signal-to-Noise & Language and Neuroplasticity & Sound. Dr. Michael Merzenich: Part 3 segment includes: Genes & Environment, The Brain’s Listening, and Language and Literacy. Dr. Michael Merzenich: Part 4 segment includes: Modern Invention, Emotional Dimensions, and Affect & Cognition. Dr. Michael Merzenich: Part 5 segment includes: Affect & Cognition and Emotion & Neuromodulation. Dr. Michael Merzenich: Part 6 segment includes: Emotion & Neuromodulation, and Code Ambiguity. Dr. Michael Merzenich: Part 7 segment includes: Code Ambiguity and Not Much of A Fault. Dr. Charles Perfetti: An Overview of Reading and Future Directions In this dialogue segment from our interview with Dr. Charles Perfetti we explore what it means to ‘read below proficiency’ and talk about possible future directions in reading research. Dr. John Searle: Part 1 – Language, Literacy and the Modern Mind In this the first part of our interview with Dr. John Searle we discuss the difference between human language and animal communication and how literacy acted as the ‘enabling technology’ that gave rise to the modern human mind and the institutions of civilization. Dr. John Searle: Part 2 – Meta-Cognitive Implications In this the second part of our interview with Dr. John Searle we discuss how becoming code users (writers and readers) changed oral language, thinking, our capacity for meta-reflection and how these changes drove the emergence of civilization. Dr. John Searle: Part 3 – Consciousness: In the Beginning was the Word In this the third part of our interview with Dr. John Searle we discuss the relationship between speech, literacy, memory, and consciousness. 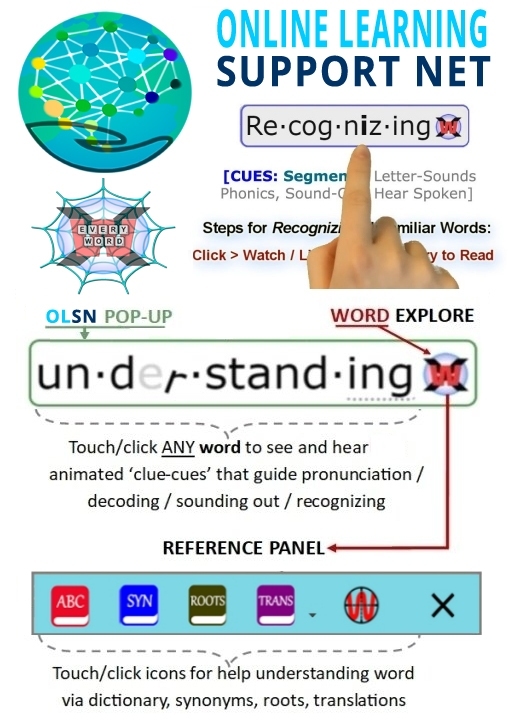 Dr. Paula Tallal: Neuroscience, Phonology and Reading – Part 9 segment includes: Exercises To Speed Up Processing Rate – Evolution Did Not Wire Us to Read – Reinforcing Learning – What Happens When You Can’t Trust Your Brain?